“All this plastic is going somewhere, ultimately, into the marine environment and also to the major drinking water reservoirs around Durham and Raleigh,” said Gerbode after one collection trip. In fact, every year an estimated 8 million metric tons of plastic waste enters the oceans. Much of that waste is washed downstream from inland sources through stormwater runoff, posing a threat to both marine and coastal environments and sea life. Gerbode’s efforts are part of a long-term project of the Environmental Law and Policy Clinic to curb plastic pollution in the oceans through urban stormwater regulation, solid waste management, and a multifaceted array of policies and partnerships close to home. Clinical Professor Michelle Nowlin JD/MA ’92 conceived the project, which in its pilot stage involves addressing plastic waste and stormwater systems at Duke University and in Durham, after learning from a clinic client how sea turtles were affected by ingesting particles of plastic waste. Clinic students first undertook research, in the summer of 2017, to confirm federal legal authority to regulate trash in Durham’s waters as a recognized pollutant under the Clean Water Act. Next, the students from the Law and Nicholas Schools gathered data on the location and type of trash — though often mixed with other waste, plastic waste was by far the most prevalent — investigated the environmental health and water quality impacts of plastic water pollutants, and mapped Durham’s watershed and stormwater system while also evaluating legal tools available for stormwater regulation. In the last academic year, clinic students crafted their research into detailed comments to Durham officials regarding the city’s renewal of its stormwater control permit from the N.C. Department of Environmental Quality. In the spring semester, after consultation with Durham Stormwater Services, students presented their research to the Durham Environmental Affairs Board (EAB), explaining the nature and scope of the problem and offering a detailed plan for improvement through such means as business certification campaigns, trash traps, and floating collection infrastructure. The clinic’s recommendations to the city were informed, in part, by their research into policies and technologies used in other municipalities. Other key information came from litter surveys the clinic carried out in 2017, which are being continued in 2018. 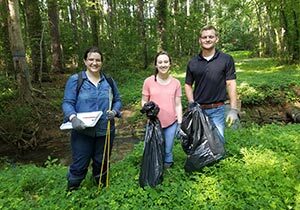 Using a protocol adapted by clinic policy fellow Talia Sechley MEM ’16 to suit smaller, inland cities, students put on waterproof boots and sampled litter from streams around Durham and Duke, cataloguing the types and locations of their finds. The clinic also worked with researchers at the Nicholas School to sample for microplastics — tiny pieces created when plastic degrades — at some of the sites. Microplastics can get into drinking water and, as Duke research indicates, they can harm marine animals such as fish, zooplankton, and coral, if ingested. The clinic collaborates on the project with nonprofits, government and other organizations in Durham, at Duke and on the coast. Students used the Duke Marine Lab boat to participate in Fishing 4 Plastic, an off-shore and near-shore plastics clean-up competition designed to raise awareness on the coast. In a full-day competition, students from the clinic and the Marine Lab netted plastic offshore, while volunteers combed the marshes at the mouth of the Newport River for litter. Overall, the clean-up collected nearly 1,000 pounds of trash, and the Duke team won for most trash collected off-shore. Sechley collaborated with undergraduate student groups on campaigns to reduce plastic use on campus. That student organizing has resulted in changes on campus. Duke Dining took a leadership role in addressing plastic pollution by eliminating single-use plastic from all its facilities as of July 1, replacing it with plant-based, biodegradable products. The clinic also worked with a group of Durham nonprofits and government agencies to organize a sold-out film screening of the short film STRAWS at PSI Theater last spring, at which Mayor Steve Schewel T’73, G’82, declared March “No Straws Month.” The clinic also partnered with professionals working in stormwater management, such as Durham’s Stormwater Services and Duke’s Facilities Management Department, to better understand what solutions might work best for Durham and Duke. For Gerbode, part of the project’s unique value is in its local focus. “I’ve always been interested in how big global problems manifest in many different places,” she said. “But at the end of the day, when you’re talking about problems that are global in nature, like plastic pollution, it’s what’s happening at the local level that is causing the global problem. You can’t divorce that from the actions that are happening on the individual city level, and the solutions are probably going to be very locally rooted, even though the scope of the problem is so big.